Exit On The Left are a young band from the Flemish part of Belgium that was founded in early 2007 and released a self-produced EP only a couple of months later. This caught the attention of Belgian punk label Funtime who decided to publish their debut longplayer I Hope You’re Writing This Down. The newcomers offer nothing new, but present a pleasing mix of punk, pop and rock. They even concede that Blink 182 and Descendents are among their major influences, making it no surprise that their finished product sounds accordingly. You will only be confronted with familiar sounds, but Exit On The Left have such an uncomplicated approach that listening will be pure fun. The songs are played mostly at a fast pace, contain a sufficient number of strong riffs, and you can’t complain about a lack of melodic choruses. Some tracks come with acoustic parts which give them a mellower touch, working favourably on Damn Right and Make Dreams Come Through. Towards the end the album turns into a more melancholic mood with the two excellent pieces Manifest Destiny and No, Not Forever. 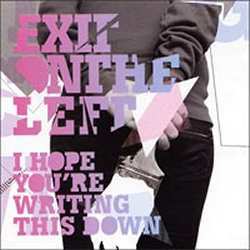 Exit On The Left’s debut is a solid effort that can convince on a technical level as well as with strong songwriting skills. I can imagine that they rock even harder in a live situation. However they have too little distance from established bands which might make it hard for them to catch their potential fans’ attention.